Why is my price on a Rolex repair less expensive than the factory? My answer to this question is why are other repair shops and the factory so overpriced? I have been a watchmaker for more than 40 years, live in a small town and have a shop with low overhead. I feel that it is better to keep my prices down and do more quality watch repair for my customers and keep repeat customers rather than overcharge on each repair. 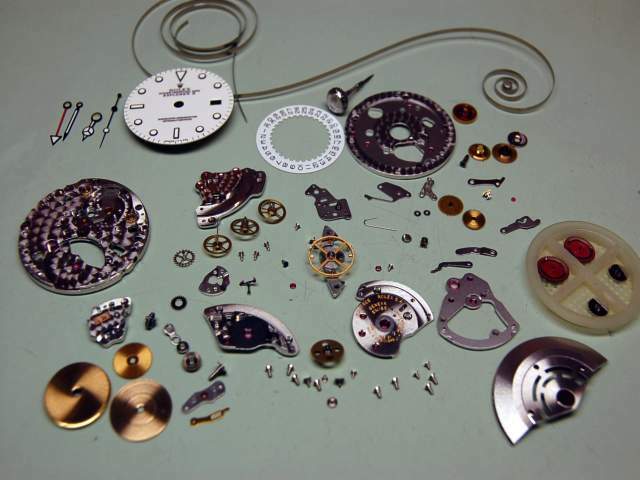 I do each repair job one at a time and pay special attention to the needs of each individual watch repair. This quick story will illustrate my point on price. I just had a customer make the three-hour drive from Pittsburgh to drop off his Rolex for service. He has a 15-20 year-old Datejust that is due for an overhaul and needs the plastic crystal replaced. He just sent this watch to the factory service center in New York and was quoted a base price of $800 for the overhaul and crystal. After he received this quote, he had them return the watch unrepaired and started doing some research on finding a local repair shop that could do the repair a little more reasonably. He found my website, we talked on the phone and he made the trip to Kane this week. I took a look at the watch and quoted him a cost of $250 ($200 for the overhaul , $40 for the crystal and $10 for new luminous on the hands). I have a copy of the price quote from the factory for you to look over. The base price for the overhauls and Crystal is $800. If you will notice, they quoted a cost of $100 for new hands — but his hands only need new luminous, which I will do for only $10 extra. There is nothing wrong with the hands, but the luminous is just faded. The factory also will not work on his watch unless they replace the dial. He had his dial refinished a few years ago by a local Pittsburgh company. It looks great and there is no trouble with it. Rolex does not like the fact that he “altered” the watch and will only do the repair if he gets a new genuine dial for $510. They also want to replace his perfectly good band for another $500. His cost before shipping is $1487. Please keep in mind that Rolex is a fantastic company, but they have “lots” of overhead and expenses. They have a beautiful office on 5th Ave. in New York City, a service center in Dallas and one in San Francisco, not counting the factory in Switzerland and various other centers throughout the world. They also have a multi-million dollar advertising budget, sponsoring events like the Americas Cup sailboat races, Wimbledon and more. These events and advertising are expensive and are factored into the cost of every watch and repair. Rolex also wants to be exclusive on the repair of their watch. They will consistently tell you that a watchmaker like me can’t possibly do the same quality work on an overhaul as they can in the factory. Lots of customers are firm in their belief that they do better work than a local guy. Most people are just tired of getting overcharged for the same work that I do. One last story on pricing. This goes back to my days at our jewelry store with my Dad and Uncle Louie. Both men loved cars. My dad always drove a Ford and Uncle Louie drove a Cadillac. Even though they were not rich men, they loved their cars. Dad would go to the Ford garage to have his oil changed and the cost would be $20 (just guessing, this was a long time ago). Uncle Louie would bring his Caddy to the dealer for an oil change and his cost was $40. This price difference always bugged him since both cars were similar sizes and used the same amount of oil. I asked Uncle Louie once why there was a price difference and he had a very simple answer: “If you can afford to drive a Cadillac, you can afford the extra cost for oil!” I always remembered that simple lesson. The same goes for your Rolex factory repair — if you can afford a Rolex, then you can afford the $800 service charge! 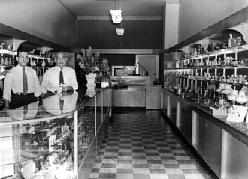 My Dad and Uncle Louie at our jewelry store a long time ago! Disassembly of the watch & movement. Replacement of all gaskets and seals. Polish case, band and crystal. Your watch is completely taken apart during the overhaul process. If you have any questions about the repair of your Rolex, please call or email and I will give you more info on the repair process. Your work speaks for itself. You’ve always done a great job on our two Rolexes. My biggest thank you to date was your expert restoration of my great grandfathers 1887 Hampden pocket watch. I carry it every other week and it runs flawlessly. Thanks Mark for being ‘THE’ Watchdoctor. I need my 1959 so presidente serviced. Never been opened, and is in phenomenal condition. Have original box and dicimentatoon. You do great work, Mark. I really enjoyed this write-up. I had no idea there are that many parts in a watch. There are engines with fewer. will be sending my rolex in to you very soon! Raving Fan of the Watch Doctor ! I’m from South Jersey. Last year I found myself on-line seeking a jeweler to repair and clean my Rolex Submariner. I found the ‘Watch Doctor’. After my call to his Kane PA shop, I felt more confident as I shipped my watch off for service. Orderly receipt and service replies, while my watch was away. Stated prices for repair and service with very reasonable turn-around-time. Upon return my Rolex looked great. Stem repair complete and watch hasn’t missed a beat in a year. Very pleased ! Since then, I am a repeat customer of the Watch Doctor without hesitation. What more can I say . . . .
A Raving Fan . .
Great stories about quality work!! Mark did an excellent job of overhauling my Rolex. He made it look like new again and I didn’t have to pay the exorbitant prices of Rolex’s factory service. Thank you Mark! Excellent story and nice repair. Clearly Rolex prices are driven by brand name and the advertizing that you mention is a big part of this. I’ve always thought that Rolex are for people who like to show their wealth (i.e. conspicuous consumption) whereas IWC are more for true timepiece lovers. I’d love to say that your repairs are up to the standards of these other shops and perhaps they are. I have had two watches cleaned by you. Both came back working great. One stopped working after about 2 months. I didn’t have time to look at it until recently, but it turned out that the collet spring had fallen out due to the collet spring screw not being properly tightened. No customer abuse here, simply an assembly issue. It was an easy fix for me, but probably not for most of your customers. I do think that you’re slightly underprice nevertheless for the Rolex work. As you mention, a new dial can run you $500. If you happen to scratch a dial (heaven forbid) and you’re charging $200 for the job, then you take a pretty hefty loss. Therefor I believe that for these pricey timepieces, a slightly higher price is justified. I have an Omega Speedmaster Professional 3570.50. I got it in December 2012. When should I get it serviced and how much do you charge? I know you said Rolex is $200.. I have sent you several customers from Canada. They were more than happy with your work and your pricing. Thank you for providing great service at a fair price. Steinway and Sons uses the same claim on tuning and rebuilding one of their pianos. I have known them to twist arms of musicians who have called me for advice, sayinng they were told if they had a non Steinway trained technician worked on or rebuilt their piano it was no lonnger a “Steinway”, This clainm is patently false. In fact, many “unoffficial” technicians can do far better work than what comes out of the New York factory today. My dad has a really nice rolex that his dad gave him, and he wears it all the time. It recently stopped working though and he isn’t sure what caused it. Usually he digs into stuff like this and figures it out, but he doesn’t want to risk making it worse. We will have to find him a professional watch repair service that he can take his cherished watch to and get it looked at. Hello Mark, my name is Alan Bacay and I was googling service cost of rolex submariners and I came upon your website. I read through all the testimonials and satisfied customers and I think you are a better choice of having my watch serviced than the authorized service center. I have a 2006 sub two tone blue face that has never been serviced. A couple of years ago I noticed it kept stopping and I did not know you can wind it. I think the self-winding feature is not working. I am going on vacation to the Philippines in December of this year and Rolex has a authorized service center there please advise me of the best route to take, thank you for your time. My rolex that i inherited from my father in law needs servicing. How do i get it to you? would like to send you my rolex sub-mariner. please contact by ph.if possible, so we may proceed with servicing this watch. I have a Rolex Oyster Perpetual Air King. Under the bracelet @ the 12 O’clock position is the number 5500.
and under that is the serial # 2458200. I would like to have it cleaned and there are pieces of the braclet missing, ie.. the clasp and a few links. What do you think it would cost to have you clean and repair to excellent condition? Thank you for any help that you can give me. This watch has bracelet sentimental meaning to me. Please forgive my typo”s in my last comment. How do I make arrangements to have my Rolex cleaned? Have Oyser perpetual date that need overhaul. Hi my submarine stopped working all of a sudden. Would an overhaul fixed the problem? I have the watch for over 17 years and wore it everyday. What is the best and most economical way to send the watch to you for servicing. Hi my submariner stopped working all of a sudden. Would an overhaul fixed the problem? I have the watch for over 17 years and wore it everyday. What is the best and most economical way to send the watch to you for servicing. I am impressed with your write up and customer responses. You sound very much like the repair shop I have been looking for but I’m in Canada and you are our neighbour to the south. Don’t know what, if any difference, that makes. Here’s the story of my watch. It is something I inherited when my uncle died. I am not sure of its age but I guess it is over 65 years old having been with his wife when she purchased it many years ago. The watch has operated flawlessly all these years until now. It will not stay running. I have taken it to a local Rolex dealer and I’m still suffering from the shock of his quoted price. Frankly I am not in that league hence my reason for searching the net for a more reasonable solution. Joseph, since you are in Canada have a look at Al Archer watches. He’s in Canada and gets fantastic reviews on many wristwatch forums. Shipping your watch to the USA could be a challenge when it’s coming back as over zealous Customs agents may apply a customs/duty fee to the watch. ( I think 1985) turn dial stem has fallen loose and does not work. Could you please give me an approximate cost…also it has not been cleaned or serviced in over five years; is that included? How do you ship & insure? Hi, found your website and have a question. My rolex submariner just stopped allowing date and time adjustment. What would be a reasonable estimate you could provide? Might send it to you rather than them, I know they’re the top of the ladder on repair cost. Thanks! Do you use original factory parts? It seems like you do some incredible work on a Rolex watch. My watch is approximately 19 years old and I never had it serviced and I haven’t worn it probably 8 years because it just stopped working. Could you please send me a quote for repair. Thank you. I have a first run 1980’s ROLEX datejust that keeps poor time ~ slow 1-3 minutes/week. I have had routine maintenance on it several times and also replaced the stem. The last maintenance was about 4 years ago. In each maintenance effort I was assured the time was properly set but it has NEVER been accurate. When I purchased it, it ran 1-3 minutes fast/week and after several adjustments is is now slow. What do you do to assure it is running accurately? How long does it take from the moment I ship it to you until I get it back as it is my main watch? What is the cost to do what is necessary? I have a Datejust Rolex that need to be cleaned and the band needs to be fixed. How much would this cost and where would I send my watch? Thank you. I have a brand new Daytona. I was in Washington DC over the weekend. It rained Saturday and Sunday. I slipped on the wet pavement and my wrist hit the sidewalk. I fractured the crystal on my new watch. How would you charge to replace it? There is a loose piece of crystal preventing the hands from turning. Also, I would like to get the watch back in time to wear it on my trip to Sturgis. I leave on August 2nd, early in the morning. Hi, i have a ladies Oyster perpetual datejust that is around 20years old. The clasp doesnt grab anymore. Can you fix that and do a cleaning on this watch., if so, how much would ut coat! Thank you! I’m in Louisiana. Contacted Mark concerning a repair on my Rolex president. Left the conversation very informed and feeling like I had been knowing him for years. I’m sold on the guy, and will be mailing him my watch shortly. I have a 1960 Rolex I received from my dad as a gift. I know that the crystal and the dial are not authentic. I cannot change the day or date of the day date presidential due to the inability to get to stage 2 and sometimes 3 when pulling the stem and Rolex won’t touch it because of the crystal and face. Approximately how much would it cost me to repair the watch and replace the face with a simple white Rolex face and Safire crystal? I have a lady ‘s oyster Perpetual date just. Probably 1990 ish. Was my mom’s and am giving it to my Daughter. We took it in to get sized and they said that the band was not good and not to wear it, there is a small scuff on the crystal, the face was the wrong color. To my knowledge it has never been serviced. I would like to get it all fixed up. Was very surprised at factory prices. Can you help? I have a men’s Oyster Datejust and the second hand works when I shake it, but stops after about 10 seconds. I have tried manually winding it and put it in an automatic winder, but nothing works. What could be wrong with it? How to contact and send for repair? Please let me know how to mail you the watch for servicing. Also ,Do you have a good used gold bezel for a prox 20 year old ladies datejust? Awesome stuff. You don’t polish the watches though. Correct? A great pity that there isn’t (To my knowledge) anyone here in the UK that shares the same sense of customer care and concern over prices that the ‘Watch Doctor’ does! Hi Mark! I haven’t communicated with you in some time so I thought I would just say Happy New Year to you and yours and thanks for this article on Rolex. The very best to you and yours. HB! Great article Mark & comparing car dealerships for service to a good mechanic shop was spot on. To all of those asking questions here, please read Mark’s website, all your questions are answered there, then just call him. He is fantastic. I never worried one bit when I sent my older Rolex to him for a much overdue overhaul! He even took photos of it after service before it was mailed back. My watch looked & ran as new again. I was so glad to find The Watch Doctor! Thanks again Mark, all the best to you & yours! I noticed you were asked a couple of times about the Rolex parts account I saw no answer I guess that’s a no? Also do you replace the main spring when servicing? I can get most Rolex movement parts for an overhaul. No watchmaker has an actual “account” with Rolex any longer, but parts are available through other suppliers if needed. I can’t supply a new dial or band, but movement parts are not a problem. When we lived in Eastern PA we were in an area where expensive cars were the norm. I remember the saying that the local Mercedes dealer “treats you like a king, and charges you accordingly”. Exactly, if you can afford an expensive car, you can afford expensive repairs! I just want to thank you for your service. Although I have a Rolex and other nicer watches I am a Chevy guy not a Caddy guy as you stated in your story. You have always done excellent work on my watches and will continue to send my business to you. I have had 3 rolexs serviced by Mark. They all work and look great when sent back. One keeps better time now than after my local jeweler serviced it. I will send more. Thanks for service in past on my Rolex, you’re the best. Will be on schedule for a lube and tuneup on explorer 39 in a year or so. Great article.